Teleférico Emirates Airline teleférico y crucero por el río Támesis. Durante su estancia en Londres, evite aglomeraciones en el metro y atascos de tráfico con un billete para el teleférico Emirates y para el crucero por río Támesis. Ideal para familias, este paquete le permite realizar un crucero alrededor de la capital con un billete de día completo de acceso a River Roamer que le permite pasar por monumentos emblemáticos como el London Eye, el Big Ben y el Tower Bridge. A continuación, podrá disfrutar de vistas panorámicas durante un paseo en el telelférico Emirates. Además, recibirá una guía de recuerdo en el vuelo y obtendrá acceso al Emirate Aviation Experience. Después de dirigirse a uno de los seis puntos de salida a lo largo del río Támesis, presente su bono en papel con un representante y reciba su billete de transporte. Puede optar por subir a bordo de un espacioso catamarán, ya sea en el muelle de Westminster, el de Embankment, el de London Bridge City Pier, el de Tower, el de North Greenwich o el de Greenwich. Ya que los barcos salen cada 20 minutos, no tendrá que esperar mucho tiempo para empezar a navegar en crucero por la capital. En función de donde se embarcó, pasará por los monumentos de Londres que flanquean las orillas del río Támesis: podrá ver el London Eye, el Tower Bridge y el Palacio de Westminster (las Casas del Parlamento), y deleitarse con la flexibilidad de subir y bajar en una atracción cada vez que esta atraiga su interés. 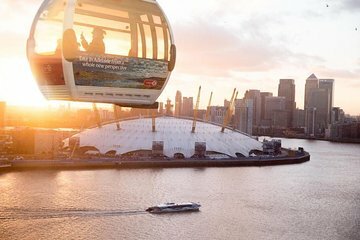 Para acceder al teleférico Emirates, baje en el muelle de Greenwich y muestre su billete a un representante. Elévese sobre la ciudad en un teleférico y disfrute de unas vistas inigualables del Parque Olímpico, el Estadio O2 y el horizonte de Londres. Pase tanto tiempo como desee explorando Londres con su pase de día completo. We tried to get on the boat by our hotel at the Westminster Bridge and it was going to be 60 minutes on the line so we took a cab all the way down to Greenwich instead, road the cable car really no reason to do this --- nothing to see, very industrial area, lots of construction. We were able to take the boat back easily from there because few people go down that far, taking a ride all the way to the Tower of London where we hopped off, took the tour and then road the boat back to the Westminster Bridge. All in all, it's not a perfect situation but it was OK and for us it gave us a different thing to do in London. We will certainly have reason to be in London again, so this was not a big disappointment for us. But if I was a tourist just making the one and only trip I will likely make to London, this is a waste of your time and you will be frustrated by it. The Emirates Cable Car was fab. Well worth the money. The Thames River Cruise was a big let down. What is the point in booking online when you have to go to a kiosk to get tickets anyway? Then the guy in the kiosk didn't read the print out properly and only gave us tickets for the cruise and the the cable car! The boats were all covered so we couldn't enjoy the beautiful sunshine and river breeze. There were assive queues for drinks with only one person serving. On the return journey we had an hour's wait for a boat and not the 20 minutes advertised. Three boats were docked at the 02 stop off but they took forever to let off passengers. I tried to phone the hotline but it is closed weekends! Never again. The whole experience was disappointing. When booking noted that we had to have a printed voucher - this alone can be a problem when traveling as not all places have a printer. We had a problem getting ours printed so headed to the office to see if they could assist, which they couldn't. Walked to a nearby hotel who were most accommodating and printed it for me without charge. Went back to the agent who looked at the printed voucher and told me it wasn't theirs and pointed me to go see someone else, who then pointed me to their office. I joined the queue again only to be told that the voucher was not theirs and sent me back to where I was originally. I advised the man at the counter that the name on the voucher was theirs, to which he continued to argue with me that they don't do a River Cruise. After a total of an hour and half we finally got on to the boat - he was right it is not a cruise as such but an hop on hop off boat. So you get to see things but no commentary - disappointing for me as I bought the tickets as a treat for our friends to join us as well. The cable car was OK but you couldn't see much of London city as too far away. It was also one way not return unless we were issued wrong tickets so lucky we had passes for the tube. We had a slight problem getting to the cable car as the signage is confusing at ground level. Apart from that, we thoroughly enjoyed both the cruise and the cable car and will tell friends about it.